A month after its opening, “Avatar” has brought in more than $1.8 billion worldwide and is still packing theaters, which suggests that it may become the first film to pull in $2 billion or more. There are many reasons “Avatar” is so popular – it is visually gorgeous and inventive, it tells a good story, and the film's casting, acting, special effects, and direction are top-notch. The film excels on so many levels that few were surprised when it won Best Picture and Best Director at the Golden Globes this past Sunday. In this column, I discuss two particular and related elements of the film – elements for which there are no formal award categories, but which I believe are deeply and instinctively appealing and critically important in life. The first of these elements is depiction of a world where connection with others is universal and, in this case, literal. Each of the natives in “Avatar” has a direct connection to the world, using what might be called bio-networking. Every lifeform has tendrils that connect to its own kind and to other lifeforms; for example, the tall, blue-skinned, humanoid Na'vi connect this way (via tendrils in their long hair) to the horse-like animals they ride and to the dragon-like flying animals they employ for air travel. Plants communicate in similar fashion; every tree has a huge number of connections to the roots of nearby trees and to other flora. Grace, a scientist played by Sigourney Weaver, tells us that the total number of connections among the trees on Pandora – the Na'vi homeworld on which the action takes place – is greater than the number of connections in the human brain, so that Pandora is actually a conscious, intelligent superorganism. The Na'vi can tap into this intelligence and its memories, and each individual Na'vi is an integral part of the planetary organism. The Na'vi clearly feel a deep sense of oneness with all life on their world, treating even the animals they hunt with respect and reverence. With this physical bio-networking of life on Pandora, writer/director James Cameron has created a vivid way to symbolize the natural sense of connection with others that is every human's birthright, but which so many humans have lost, usually early in life – during a drugged or otherwise unnatural birth, before birth by a mother who smokes or drinks or uses other drugs (or who is simply malnourished or under severe stress), or during a repressive, cold, or violent infancy and childhood. Born for compassionate connection to others, we are miserable without it. The effects of this widespread damage to our sense of connection to others are visible throughout the world, in every cold-hearted, mean-spirited, or simply unfeeling behavior that people inflict upon each other. Ultimately, this emotional damage is a key element in everything from massive tyrannies and global empires to schoolyard bullying; from corporate misbehavior to spousal abuse; from needless environmental damage to animal cruelty; from depression and suicide to widespread use of drugs to dull the pain of a life cut off from others and, to an extent, even from ourselves. Emotional damage from early trauma is a major cause of physical disease as well as depression and other emotional problems. Cancer, chronic obstructive pulmonary disease, and other devastating illness is far more prevalent among those who suffered early trauma of almost any type. The huge and well-respected ACE study [pdf] shows this in detail, as do many other studies and observations. The ACE study also shows how very common such trauma is. Immersed in “Avatar,” I felt an electrifying sense of how different life could be here on Earth, if only our natural sense of connection with others, and with all life, was not so widely damaged. One reason “Avatar” will become the most popular film of all time is that it transports viewers to an alternate version of life where the compassionate sense of connection to others has not been lost. No wonder so many people are seeing this movie more than once. The second powerful and fundamental element in “Avatar” is open acknowledgement that tyranny (here in the form of coercion and violence against weaker peoples, in the service of taking their resources) is not merely wrong but horrifyingly evil. That might not sound appealing, but the acknowledgement that tyranny is evil resolves, if only unconsciously, an unhealthy and painful dissonance of life in any of today's modern empires or tyrannies, where cold-hearted violence and cruelty against the weak and against those who resist are presented as positive, as necessary for the common good, as supporting "freedom," as "protecting the homeland," as saving people from themselves, or as some other twisted fantasy that the power elite have elected to use for propaganda purposes. Political tyranny, non-defensive coercion and violence, massive theft, and other injustice are never anything but evil, and seeing this fact acknowledged is liberating and to some extent therapeutic. Encountering a bit of sanity supports our own emotional health and often makes us feel better – it certainly makes me feel better. “Avatar” is not the first film to showcase the evil of tyranny as a theme and it won't be the last, because freedom– the opposite of tyranny – is a basic human need. Coercion is cruelty in and of itself, and even "soft" coercion typically escalates into something harsher. “Avatar” shows this process in action, putting us in the midst of both the victims and the victimizers. Here on Earth, we generally get a more one-sided view; the media serve the interests of the power elite (who own and control that media) and thus filter news and entertainment through the elite's pro-coercion paradigm. Cameron does present the oppressors' viewpoint in “Avatar” – it sounds very much like what Americans are used to hearing on television and from those In Charge – but Cameron also presents the situation and viewpoint of the oppressed; that is where “Avatar” differs from what we usually see. The juxtaposition of both points of view makes the truth unavoidable. Cameron does a terrific job with a powerful theme that – tragically – is as relevant today as ever. Part of the genius of “Avatar” is that it sets this familiar yet important theme on a world so different from Earth as to distract us from how closely the story parallels the corporatist/imperial tyranny of modern America (and, among other places, modern China). The gorgeous, alien setting lets the story get closer to us, and closer to reality, than it otherwise might. “Avatar” sneaks in under our defenses to show us what was in front of our eyes all along. Interestingly, China has reportedly ordered cinemas to stop showing Avatar (except on the relatively few 3D screens), at least partly for fear, some believe, that it would incite civil unrest. The film had already become the biggest box-office hit in China, after only a week or so. Another truth hidden in plain sight in Cameron's story: When corporations want military power at their disposal, government is the supplier, whether directly or otherwise. (Plus, government has the "get out of jail free" card for sale, making the power safe to use for corporate officers.) Government has the firepower and is based, at bottom, entirely on force, even in a democracy. Corporations buy the use of government force – for industry advantage via regulation, for direct subsidies, for legislation that brings the corporation new business or that protects existing business from competition. This bonding of corporate and government power is the essence of corporatism. Politicians sell the use of government force because that is what they have to sell, and they covet the wealth that corporations generate. Every year, and no matter which party is in power, this corrupt process continues. See Stephen Kinzer's Overthrow: America's Century of Regime Change from Hawaii to Iraq for an excellent and very readable look at the topic (or rather, one part of it). Chapter after chapter, Overthrow reads like a variation on Avatar's screenplay, but with humans instead of tall, blue aliens being the ones tricked, oppressed, lied to, dispossessed, spoken of as less than human and treated accordingly, and sometimes killed. “Avatar” brings this twisted and commonplace dynamic to light – reminding us of things we already knew but may not have put together consciously. The world doesn't need to be run by psychopaths willing to wreck the planet, to steal what belongs to others, and to maim or kill innocents to get what they want. This world – our world, Earth – could be a peaceful, healthy place where people feel connected to each other and to all life, and where "submit or die" – the inflexible demand of every government to its own people, and often to those outside its own borders – no longer helps block the emergence of a healthier, more loving world. In “Avatar,” the natives actually win – a feel-good ending if there ever was one. The Na'vi send the rapacious corporation and its ex-military contractors packing. The natives save their planet from the widening destruction that neurotic, disconnected humans had planned for it. As the movie ends, an obvious question remains: Will we succeed at freeing Earth from the destruction that neurotic, disconnected humans have planned for it? Will we end tyranny and find again that sense of connection our distant ancestors hid within themselves so long ago? Will the human race regain its humanity? The gulf between "what is" and "what could be" is vast. Anything which helps us cross that gulf and experience, however faintly, the compassionate and respectful community we expected when we entered this world is special indeed. It appears that for millions of people, “Avatar” has that ability: it gives many viewers a sense of the world we were meant for – a world where love and freedom are the norm instead of vague, longed-for ideals. That puts a truly subversive thought into play: We could heal this world instead of letting it continue to sicken and die. The award “Avatar” won't be getting, but should, is for not only reminding us of this life-and-death issue but for providing a lush, cinematic depiction of a healthy, connected world that values and attains freedom – phase-shifted just enough that we can embrace that world and be thrilled by it without our defenses kicking in to block the experience. “Avatar” suggests one important method for change: refusing to put up with evil. I'd like to suggest two more: reducing and eventually abolishing the use of coercion to run society (an extension of the method above), and working to increase the levels of love and freedom in society, especially in the lives of the young. The sense of compassionate, respectful connection to others is entirely natural; we only need acknowledge it, focus on it, and protect it – as widely and consistently as possible – to begin the process of healing this world. Will we do so in time? There is no more important question. The advancement of modern technology is heading into the vertical part of the curve, and a world run largely by psychopaths and coercive systems will not make healthy or perhaps even survivable use of such technology. Other problems (population growth, freshwater shortages and pollution, pollution of the oceans, and more) also require clear and healthy thinking to resolve properly. 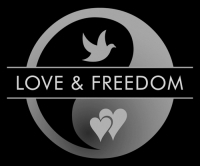 Love and freedom are the answer. We are born for nothing less.